We are the best manufacturer and trader of the Photoluminescent Signages. We are known to provide the high quality of Photoluminescent Sandwich Signages. This Photoluminescent Sandwich Signages is made with fine quality of material and widely appreciated for its rugged construction and fine finish. Photoluminescent sandwich signages made of 2 Acrylic sheet 6 mm thick each processing in between both acrylic Photoluminescent sheet of rare earth aluminates working on principle of light for safety signages on radioactive, fungus proof, maintenance free higher durability weather proof energy conservative. We are the best known manufacturer and trader of the Photoluminescent Signages. 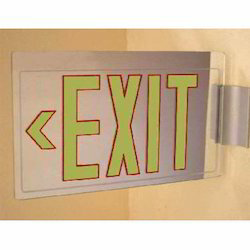 These photoluminescent signs are a perfect option for areas with possible electrical power failure. 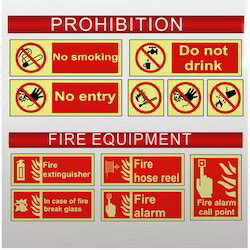 Our customers can avail this safety signage from us at affordable rates. Photo luminescent way guiding system made of powder coated aluminium carrier exertion holding 1 mm thick aluminium inserter of photo luminescent sheet by rare earth aluminates working on the principle of light energy with polycentric side cascading non-radioactive, fire proof, maintenance free, higher durability, weather proof, energy conservative it guide the person the right way to go out at the time of black out and fire. We are engaged in offering our clients with a range of Photoluminescent Safety Signages that are reflective and emergency light based signage. Our range acts a hassle free and convenient evacuation during emergencies. 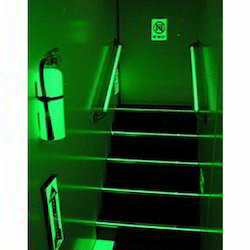 These Photo Luminescent Safety Signs are available for exits, fire exit, fire extinguishers, and danger. Moreover, our range can also be designed and colored as per the requirement and specifications of our clients.